This section of the British Mountain Guides website includes public information for our members and other interested parties. Those applying through the existing British Mountain Guides Training Scheme may join the Association. To apply to start the training process you will find information here at Become a guide. For existing guides renewal can be made online using your online account via the Mountain Training Candidate Management (MTUK CMS) system. Membership renewal is usually required by the 1st of January in any given year, allowing distribution of IFMGA and BMG Carnet renewal stickers. Renewal is subject to Continuing Professional Development (CPD) requirements being met and Professional Indemnity insurance. Occasionally fully qualified guides from other nations who are members of the International Federation of Mountain Guiding Associations (IFMGA) may be permitted to join the British Mountain Guides. To do so, such guides need to meet our high standards which can be found in the guidance document ‘BMG Entry Requirements’. Details should be requested from the British Mountain Guides office, please Contact Us. In order to remain a member of the British Mountain Guides, you must continue to meet the professional standards that the BMG and IFMGA set for your profession. These professional standards are how members’ fitness to practice is determined. It is important that British Mountain Guides are able to practise safely and effectively, while maintaining high standards of conduct. In addition, you should not do anything which might affect the public confidence in you or your profession. However, we do not dictate how you should meet these standards and rely on our ‘Code of Professional Conduct’ and ‘Continuing Professional Development (CPD) Guidelines’. As an autonomous and accountable professional, you need to make informed and reasonable decisions regarding your practice, making sure that you meet the professional standards required of a British Mountain Guide at all times. This may well include getting advice from employers, supervising guides, colleagues, local guiding bureaus and adhering to local agreements and normal practice to protect the wellbeing of your clients. We recognise the valuable role of other national mountain guiding associations and UK membership associations in representing and promoting the interests of their members, in the same way we do our own. The British Mountain Guides will continue to provide guidance and advice regarding good practice alongside that of other nations. 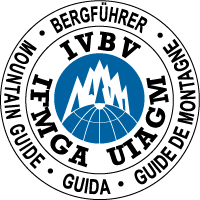 The British Mountain Guides Code of Professional Conduct is available to members of the BMG via the ‘Members’ Area’ of the BMG Website. British Mountain Guides are required to submit details of all Incidents and Near Miss Events within 48 hours. To assist guides in meeting this requirement, online reporting is available via the BMG Website ‘Members’ Area’. Further assistance can be requested from the British Mountain Guides office, please Contact Us. Concern regarding the professional conduct of other guides should be resolved by discussion with the member concerned. Guides are reminded of their responsibility as a professional and shall take steps to bring misconduct to the attention of the Professional Standards Chair, doing so without malice. The BMG provides various materials to assist in promoting your membership of the association including: BMG Badges, IFMGA Badges and Stickers, as well as leaflets and roller banners for events. These can be accessed via the Mountain Training Candidate Management (MTUK CMS) system shop or by contacting the BMG Office. The British Mountains Guides recognise that the profession of mountain guiding is highly regulated in Europe but remains unregulated in the UK. We recognise the valuable role of those with UK qualifications in climbing and mountaineering instruction, but seek to promote the profession of mountain guiding and the British Mountain Guides through demonstration of our membership and adherence to the highest professional standards. Proficiency: Members of the British Mountain Guides are encouraged to promote their membership and membership status to demonstrate their continued proficiency in the profession of mountain guiding. Assurance: Promoting your membership provides assurance to end users that British Mountain Guides meet the highest national and international standards in training, technical skills and behaviour. Differentiation: Promoting your membership also provides reassurance and differentiates you from non-regulated providers of climbing and mountaineering instruction including those who choose to use the sensitive term “mountain guide”. The British Mountain Guides Logo is designed to be simple, bold and easily recognisable in different formats. The BMG Logo can be used on your marketing materials, business cards, stationary, website and vehicle livery where it relates to your membership as an individual. It is available for use by Trainee, Aspirant, Full, Retired and Honoured Guides. Full members of the British Mountain Guides may also use the ‘GUIDE Logo’, which is the preferred option for use on clothing. Trainees and Aspirants must display wording wherever a logo is displayed to clarify their membership status. In addition, you must only use this logo in association with activities that you are substantively qualified to deliver under the auspices of the British Mountain Guides Training Scheme. To use the British Mountain Guides logo you must be a member of the British Mountain Guides and abide by the ‘Guidelines for BMG and IFMGA Logo Use’ and the BMG’s Code of Professional Conduct. Further details in the BMG Website ‘Members Area’ or from the BMG Office. Organisations can use the BMG Logo in advertising which is directly connected to a named Guide. Where organisations are providing mountain activities there must be no ambiguity as to the level of responsibility taken on by the Guide – it must be all or nothing. Where these organisations employ others, advertisements must make it explicit that persons other than BMG members may be employed. The logo is not to be used when an individual guide’s membership is not current, should they be suspended from practising their profession for any reason, or by those who are non-members. Use of the logo by non-members is not permitted and any instances of unauthorised use will result in contact by our Professional Standards Chair. To use the IFMGA logo you must be a full member of the British Mountain Guides and abide by the ‘Guidelines for BMG and IFMGA Logo Use’ and the BMG’s Code of Professional Conduct. Further details in the BMG Website ‘Members Area’ or from the BMG Office. Trainee and Aspirant Guides may not use the IFMGA Logo as they are not members of the IFMGA.  The IFMGA Logo may be used to advertise an individual guide’s services, or when all those employed by him/her are members of the IFMGA. 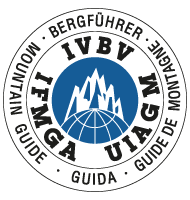 Organisations can use the IFMGA Logo in advertising which is directly connected to a named Guide. Where organisations are providing mountain activities there must be no ambiguity as to the level of responsibility taken on by the Guide – it must be all or nothing. Mountain guiding agencies and companies may only display the IFMGA Logo where all Directors are members of the IFMGA. Where these organisations employ others, advertisements must make it explicit that persons other than IFMGA members may be employed. The term ‘mountain guide’ is not a protected title in the UK. While the British Mountain Guides recognise that non-regulated providers of climbing and mountaineering instruction also use this term, we wish to differentiate our members’ skills. Where possible the British Mountain Guides wish our members to use the designated title of ‘British Mountain Guide’ or ‘IFMGA Mountain Guide’. For British Mountain Guides who wish to refer to their international membership of the IFMGA/UIAGM/IVBV we recommend use of the English title and abbreviation the ‘International Federation of Mountain Guiding Associations’ (IFMGA). The term “certified guide” is often use by IFMGA Mountain Guides who are members of other mountain guiding associations e.g. those in the United States of America and Canada. This term is not used within the British Mountain Guides Training Scheme and you should avoid using this expression. The British Mountain Guides provides guidance to members on the use of social media. This document can be found on the BMG Website ‘Members’ Area’. There are many benefits to social media including improved communication with supporters, partners, associated professional organisations as well as our clients. Most British Mountain Guides who use social media already do so responsibly while adhering to the BMG’s Professional Standards. However, the lines between public and private, personal and professional are blurred in online social networks. By virtue of identifying yourself as a mountain guide within a social network, you are now connected to your colleagues, association and the IFMGA. You should ensure that content associated with you is consistent with your work. Many British Mountain Guides practise their profession in the countries of the European Union (EU) and further afield. If you wish to practise in the EU a declaration using the European Professional’s Card (EPC) is required. Working in another EU Member State without an EPC (even for a short duration), could be considered an infringement in law and British Mountain Guides should consider the possible consequences. (i) Log onto http://europa.eu/youreurope/epc where you can create an account on ECAS (European Commission Authentication Service). (ii) After creating your Account, make an Application for an EPC (Temporary) on the same your-europe website by clicking on Access the EPC Procedure. The British Mountain Guides recognises that many of our members circumstances will be different. In addition to the EPC, applications may be required to local or national authorities e.g. ORisk in Switzerland, Carte Prof/Libre Etablissement in France.